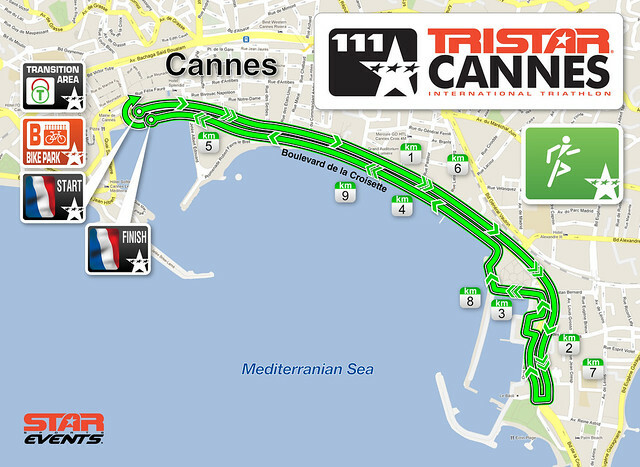 The Run course of TriStar Cannes will take athletes out to the city centre of Cannes. 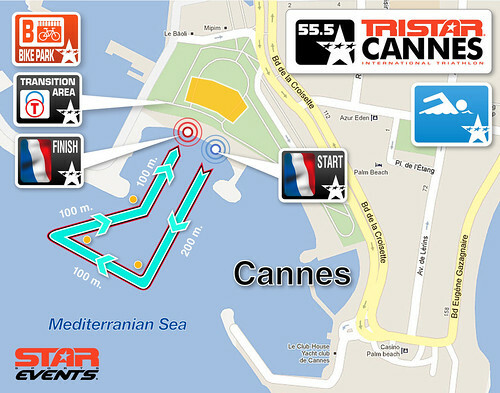 Enjoy one of the most beautifull run race courses of all the International TriStar Series. Guillamue Romain, leading the bike! As an athlete you have to take care of your body every day. As a triathlete you enjoy yourself swimming in clear waters, cycling across lush countryside and running while breathing fresh air. That's why Star Events pledges to protect the environment in partnership with the 4vita Foundation.Take care of nature as you would your body. You want to benefit from it all your life! 4vita is the environmental plan which includes environmental and health actions during each Star Events race. In collaboration with Cannes town council, the 4vita waste disposal plan: Ensure that all waste is accounted for through the collection mangagement schem. That all athletes are aware of the importance of the Eco-Zones and do away with their waste there and only there. 4vita support the "Bouchons d'Amour" foundation which helps gather and collect plastic bottle-tops, by collecting funds, to help handicapped athletes. Performance Nutrition team Relay team. This team will also do TriStar Deauville and TriStar Monaco. Thanks!!! The swimming start was cancelled. The race is on! All the athletes started running from the exit of the swim area and went running to the Transition 1 to start the bike leg. 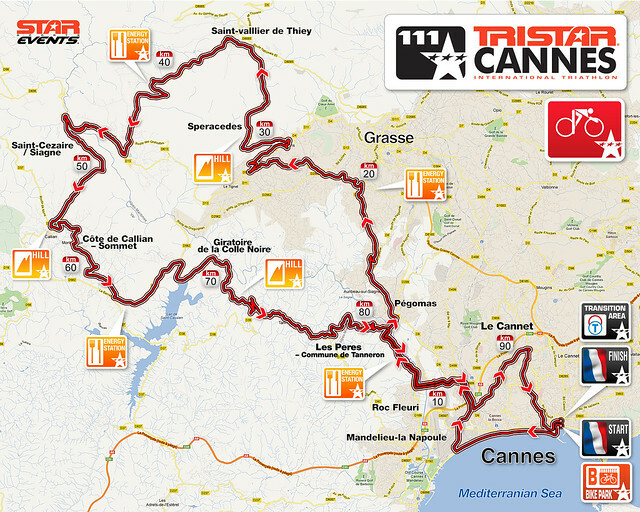 TriStar Cannes Bike Course is specially demanding and tough! Tha participants start at 8:30 rom the water with the pros ahead - they wear differently colored swimcaps so they are easier to distinguish. It's a swim around 3 buoys before the athletes can exit the water. 1000m for the TriStar111 athletes and half the distance for the 55.5, with the same start and exit areas. Daniel Fontana (ITA), other of the favorites for the victory today! After leaving the water on the Quai Laubeauf beach you have to get to the transition area installed on the Pantiero Square, pick up your bike bag (red) then you change in the transition tenth. Then, off to the bike park to get your bike and leave on the North-East side. The cycling route starts on the infamous Croisette of Cannes on the way to Grasse. 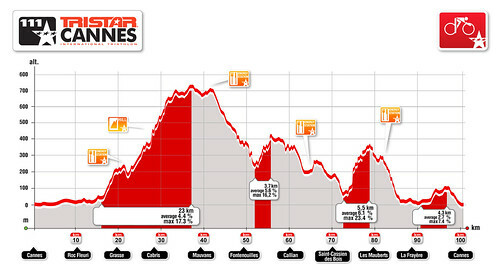 The serious stuff starts next on the splendid inland roads with the ascent of "Cabris-St Vallier" and of "Tanneron" in particular before riding bak to Cannes. Running takes place over 2 laps on the famous "Croisette" of Cannes! From the Festival Hall to Palm Beach, you will take advantage of the most famous avenue of the "Côte d'Azur" in the steps of the celebrities of the Film Festival! The complete running course is open to supporters!!! TriStar Cannes is a great sports gathering. One of the corner stones of the Star Events organisation is Social Responsability. "Sport plays a part in each of our lives!". That's why, TriStar Cannres in partnership with the Peace and Sports Foundation strives to promote organized sport and its values, as a tool for educating the up and coming generations, as a vector of social stability, of gathering and binding between communities. Available at the Star&Co Village, the TriStar-Peace and Sport encourages you, your friends and family to make a difference to someone's life. Look out for the Peace and Sport team or come and meet them on the information stand to take part in the various events offered by the Foundation. Thank you!!! Stay tuned! Lucas Di Grassi announces a TriStar111 this year in Brazil! 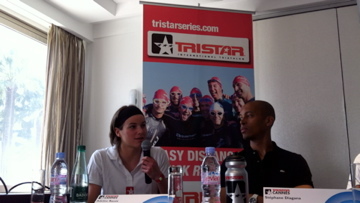 “As an official TriStar Ambassador I can’t wait to start racing tomorrow in Cannes. I train here a lot, and I will try to finish under 5 hours… Hope the forecast is wrong and we will see the sun tomorrow and enjoy Cannes this international triathlon”. 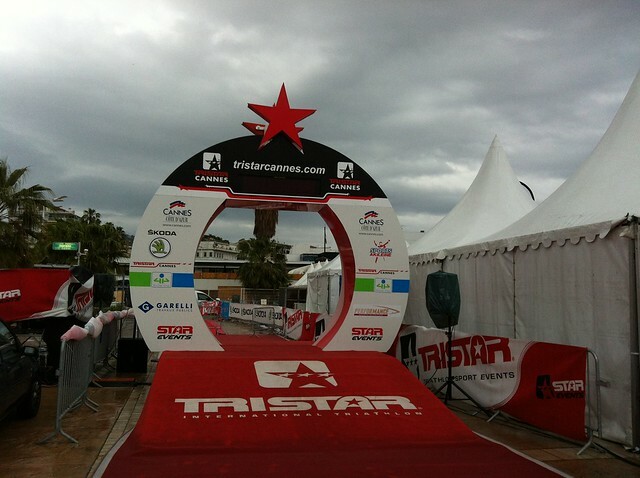 TriStar Cannes officially presented: The red carpet is ready… to welcome 1,100 athletes at the Finish Line! This exciting new international event in the Côte D’Azur has been officially presented today at the Radisson Hotel. We are setting up all the stuff for the TriStar Cannes Official Press Conference at the Radisson Hotel&Thalasso Cannes, starting at 11:00! Some of the best professionals will be here! With Tinefoto.com we are doing some nice photo shooting these days ;) Stay tuned and soon you can preview the "Making off"
German Pro Athlete Till Schramm becomes new TriStar Ambassador in Cannes! German Pro Athlete Till Schramm becomes new TriStar Ambassador! Welcome on board! We love fun and sporty people like you, good mood, energy and triathlon style! Located on the Côte d'Azur, Cannes is a very dynamic and attractive town for its cultural life and its touristic side. It is also the venue of one of the most famous international festivals; and actually, Cannes itself could be described as "giant cinema scenery". TriStar Cannes is positioned at the top of the European calendar for 2012, and brings a unique opportunity to start the season in France offering athletes and their families the possibility to enjoy this little paradise on the Mediterranean coast. Fun is guaranteed and triathletes can show their qualities in the same streets as those walked by the actors during the Cannes Film Festival. Paul Belmondo speaks TriStar Cannes! 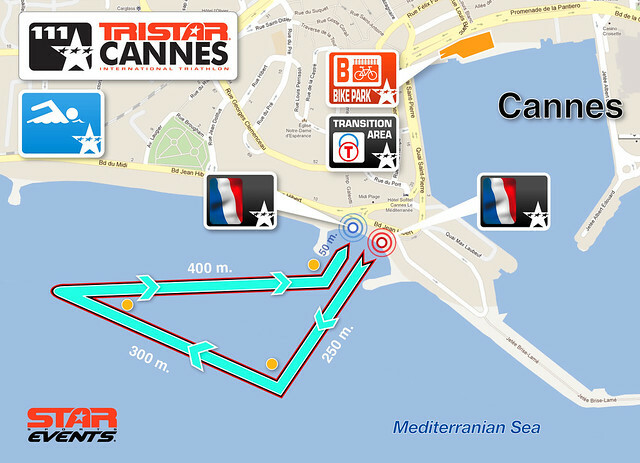 Coming up: TriStar Cannes Live Coverage this weekend! 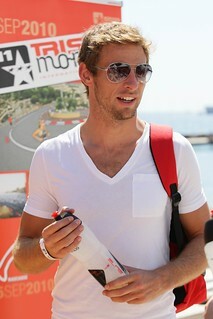 Celebrities, PROs and F1 drivers walking the red carpet of TriStar Cannes! 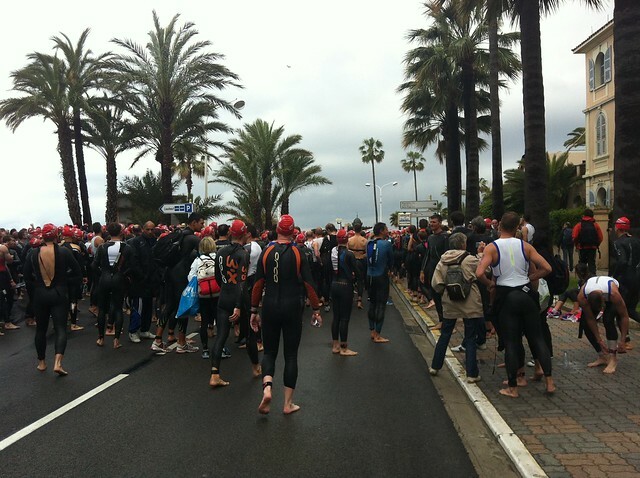 1 km long swimming part takes place on the beach in the quay Laubeuf in Cannes. The loop of 100 km bike ride starts on the Croisette and takes competitors to Grasse and rugged mountains of the hinterland. The breathtaking views and picturesque villages of the bike ride are some of the highlights of this triathlon in Cannes. The 10 km running part is made of two loops round trip on the well-known promenade Croisette, starting from the famous Palais des Festivals going to Palm Beach and will lead participants to the Finishline located on the Esplanade de La Pantiero. Among the favorites for victory, there are many French athletes belonging to the world's top in long distance. The French contingent will be represented among others by François Chabaud and Hervé Faure, respectively second at Ironman France and winner of last year’s Embrunman. The Franco-Swiss Olivier Marceau, already a triple-winner in TriStar races (Monaco in 2010, Mallorca in 2011 and Nevis in 2012), will surely excel on the track he knows by heart, living currently on Côte d’Azur. The foreign forces, including Daniel Fontana (ITA) and Joe Skipper (GBR), will also want to have a say at the second TriStar in European season that already promises an exciting show! As for women, the suspense will be just as intense: will it be one of the French triathletes Jeanne Collonge or Delphine Pelletier, the Danish Simone Friis, the Swiss triathlete Adeline Rausis, or the Hungarian Gabriella Zelinka that will be able to win this inaugural TriStar Cannes? Looking at the relays, two French professional triathletes Alexandra Louison and Charlotte Morel will be fighting for a victory in the mixed relays category. As the red carpet suggests, many celebrities will be present to open the first TriStar Cannes. Among them, Paul Belmondo, patron of the event, well used to the 111 distance, who has already raced TriStar111 Monaco twice and TriStar Nevis at the very beginning of this year’s season. Stéphane Diagana, one of the most charismatic French athletes of his generation will be on the start line and goes straight for the king distance, since the former World Champion in 400m hurdles chose to go for the 111 kilometers. Several racing drivers will also participate in the 29 April race on the Croisette. The former world champion Jenson Button (Great Britain), Lucas Di Grassi (Brazil) and Alexander Wurz (Austria) will be ready to fight amidst of thousand participants of the event. The first edition of the Akileïne Escarpins Tour starts at 14:00, you could register from 12:00 at the Star&Co Expo. Star Events together with Sports Akileïne will launch in France a new spirit in the running world by organising races of women in heels! From 15-18h00, the bikes and bags check in will take place, while the Star&CO Village will be open from 9-19h00.